The Middle East, the Orient, the ‘Levante’: a melting pot that blends Arabic-Israeli cultures and cuisines – particularly #inAbuDhabi, where history and bold visionary thinking meet on eye-level, and so do people from numerous cultural backgrounds. Seductive scents lure visitors onto traditional spice markets, and no more than a stone’s throw away master chefs of various origins create culinary delights from those fresh ingredients. 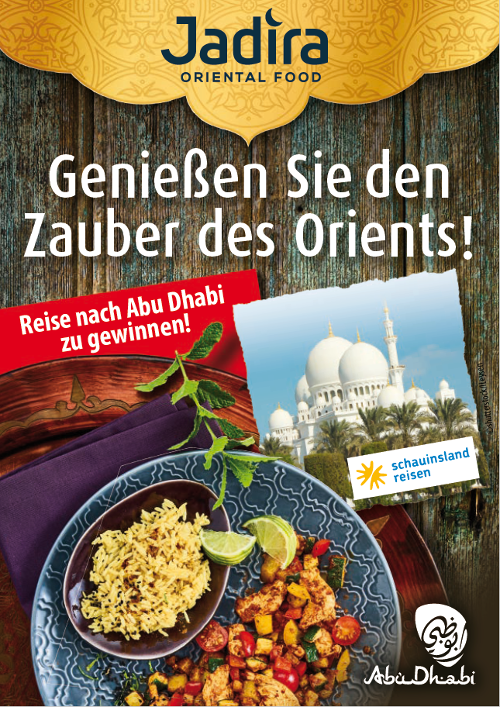 Branded campaign sales-displays and attached booklets featuring authentic recipes from Abu Dhabi invite consumers to embark on a culinary trip with JADIRA’s products in their very own home. To fully immerse in the scents and tastes from the Middle East, an unforgettable trip to Abu Dhabi is raffled additionally.